Living a Crafting Life: Scrapbooking Process: More Nautical Fun with "Down By the Shore!" 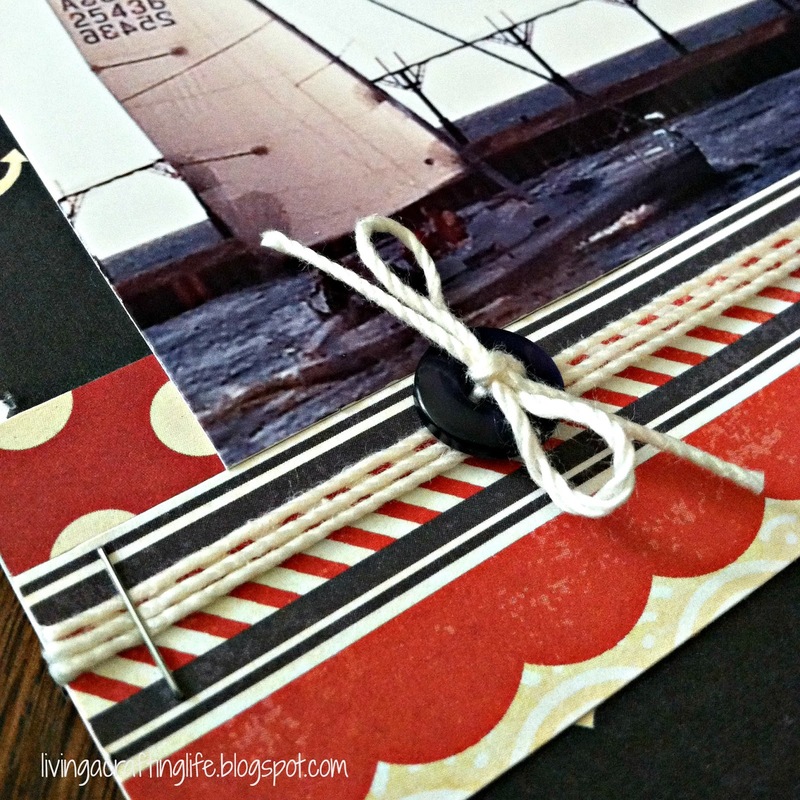 Scrapbooking Process: More Nautical Fun with "Down By the Shore!" It has been so much fun using the new "Down by the Shore" collection by Fancy Pants that is available at The Memory Nest store! This week I finished three more layouts, two of which I will share here. I used the paper, stickers and punch-out diecut banners from the collection, and added other embellishments from my own stash. This is definitely a summery layout -- with all that golden sun! 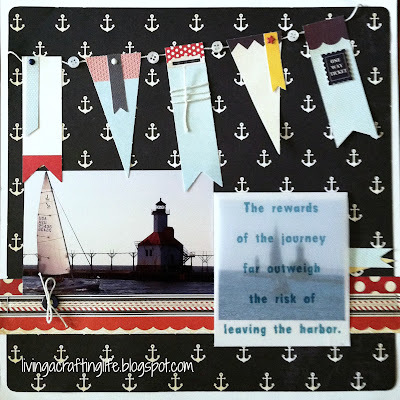 I used left over borders from the previous layouts to add a contrasting topper to the page, along with some other scrap strips to anchor my photos. 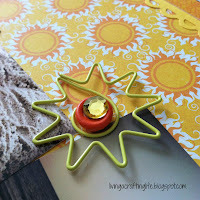 I added the sun paperclip, button, brad, washi and rhinestones from my stash to dress it up. The Thickers in the bold, bright blue should express the fact that I was so glad to be back on my hometown beach! For this layout, I used the rest of the banners from the diecut sheet, strips of paper unused from other layouts, adding my buttons and brads, natural color crochet twine and vellum quote. Under the quote is another small photo of the same location. The layout is 11-1/2" square, matted on white cardstock. 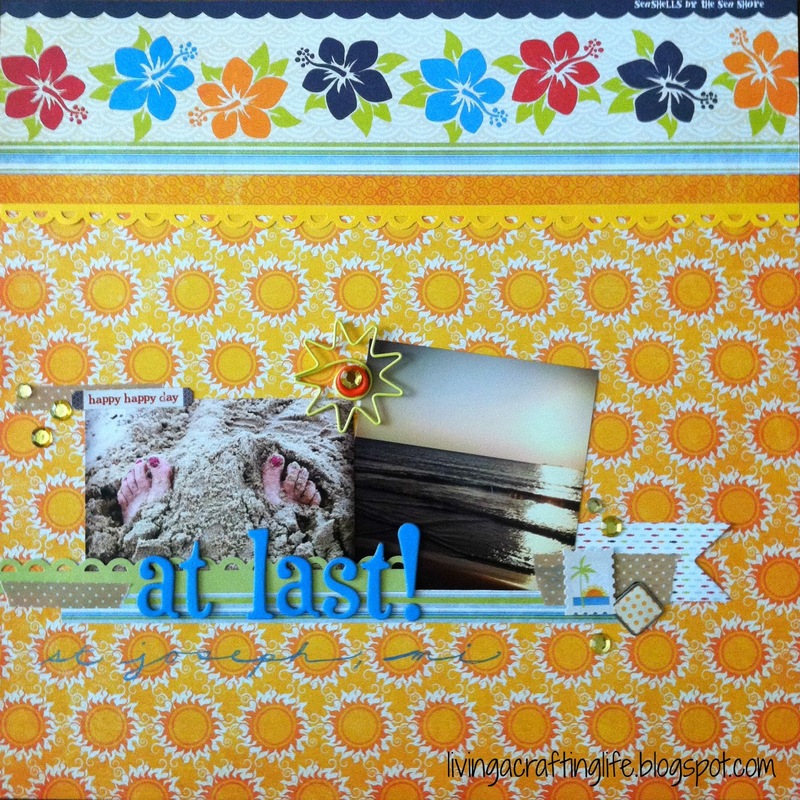 Again, two completely different summer layouts; one collection! 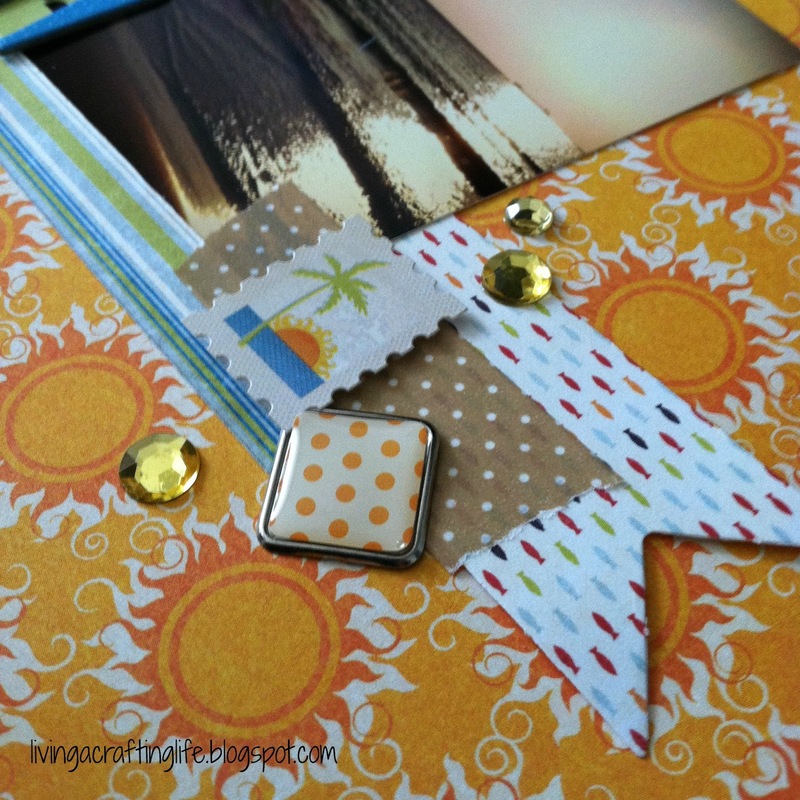 Order the "Down By the Shore" collection now from The Memory Nest so you can scrap those wonderful summer photos! AND -- save 20% by using the special code SEPTNEW20 before the end of this month! 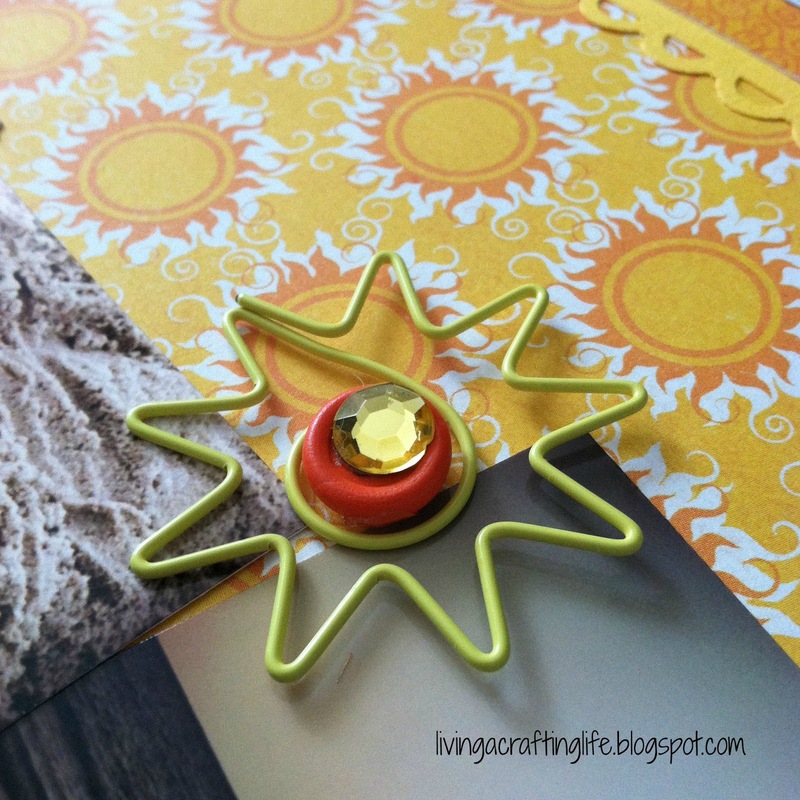 The Memory Nest is the best place to get your scrapbooking supplies. Great customer service, fast shipping and excellent prices. 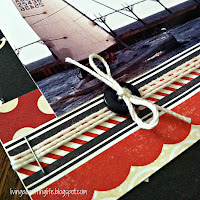 Find more inspiration on this collection and all the other new paper lines at The Memory Nest blog. Beautiful work with this collection! I especially like the banner on the second layout. Thanks! This paper was so much fun to work with, and so versatile! Appreciate you stopping by!